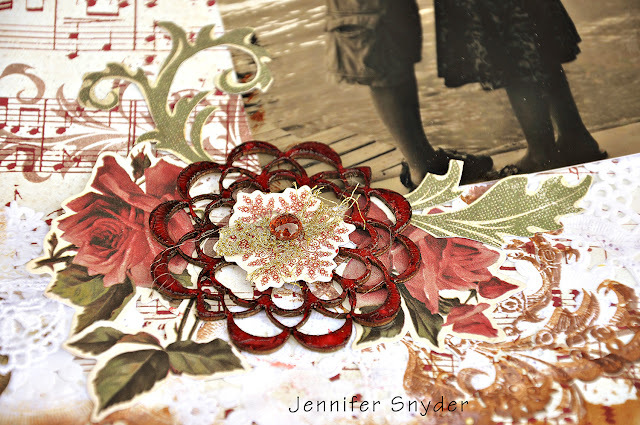 I created this card using elements from Scraps Of Elegance. 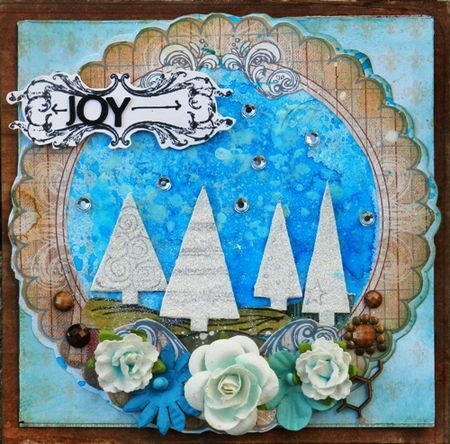 It's for the 12 Days of Christmas Card Challenge at Prima Marketing. This is the Prima 12 Days of Christmas Card Challenge Day 9 design by the talented Gerry van Gent. Since Ian a Gerry fan, I picked her lovely design. You can see all the inspirational cards and projects on their Facebook page. Thanks for looking. Consider joining us over at Scraps of Elegance and design something beautiful. 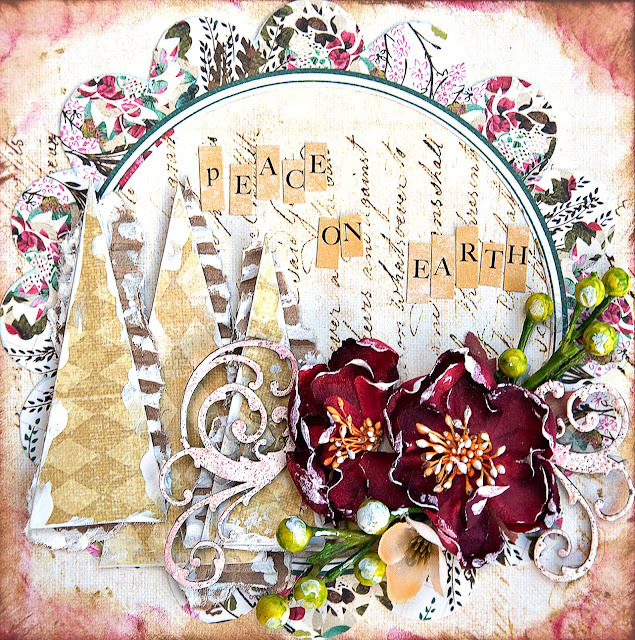 I am playing along with the Prima 12 Days of Christmas Cards. Here is my card. Got it in at the very last min...hours actually before the winners were picked. Phew. It was selected as the winner for day 10. Only because of the inspiration that came from Solange's original design as seen below. You can see all the winners here at the Prima Blog. I used the Dusty Attic Mini Scrolls DA0685 for some flourishes. I covered them with Stampendous Aged Pink Embossing enamel. 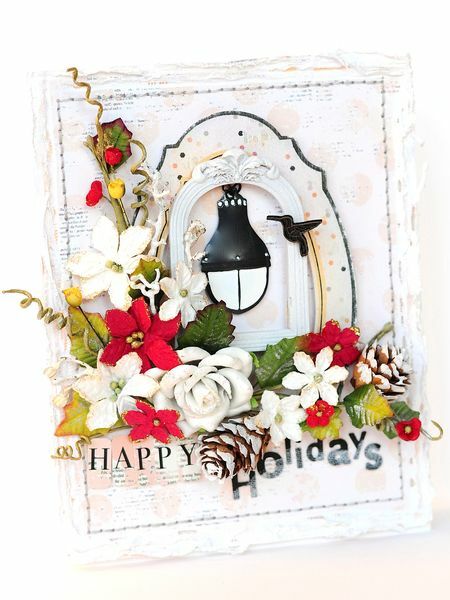 This card is by by Solange Marques and is Day 10's design. So this is my inspiration. Thanks for looking. Have a great day. 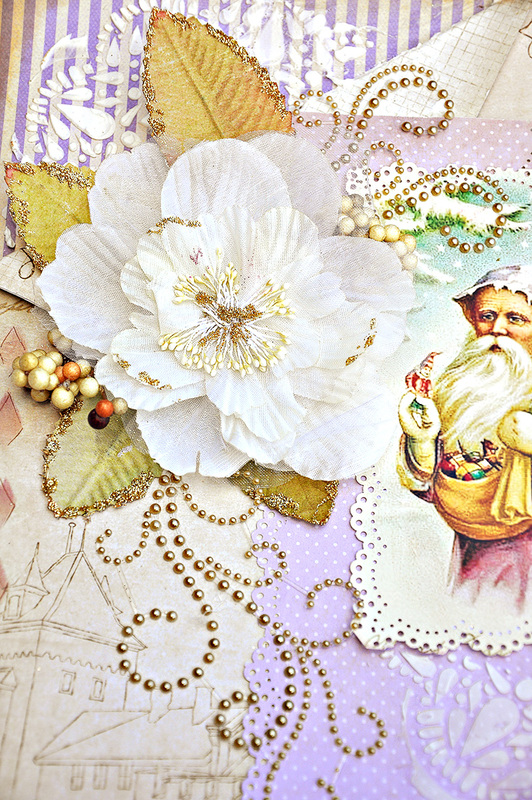 Here is a vintage Santa that features ZVA Creative pearls and flowers. The Santa is an old postcard that I found at Flickr - thanks to Suzee-Que. 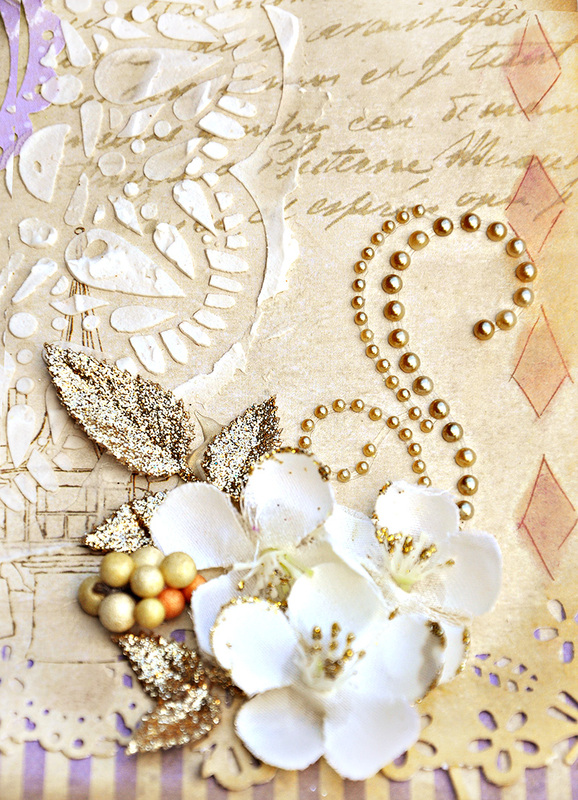 I wanted my page to have a little gold shimmer so I add some gold glitter to my flower and to the leaves. I used super tacky glue on the edges and added my gold glitter. It picks up the taupe tones of the pearl flourish nicely. The paper I chose is the DCWV -Chateau Lavender Stack. Lots of gorgeous creamy warm tones. Come visit us ZVA Creative on their blog. ZVA Creative also has a Facebook page. Join us for the fun and the inspiration. 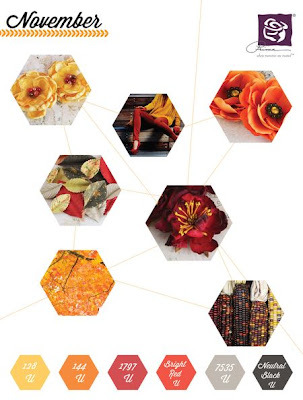 I am so thrilled to be designing for ZVA Creative. Thanks a bunch to ZVA and to you for visiting. 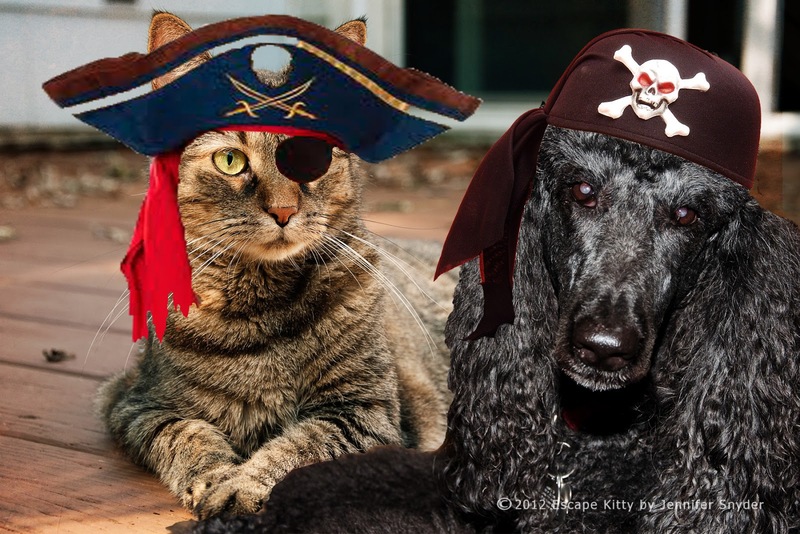 The November ZVA Creative Blog hop is complete and the winners announced. You can see the official announcement here. Big Congrats and thanks for playing along. We’d like to congratulate the following SIX ladies who joined us on the blogs listed below and won a prize! Thanks for offering such a fab giveaway! Made it here! c’est une très belle page bravo!!! 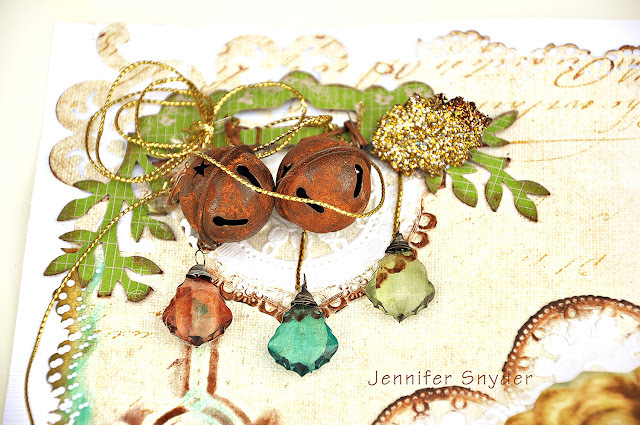 The colors and cluster work are awesome Jen! Love the burlap wrap too. 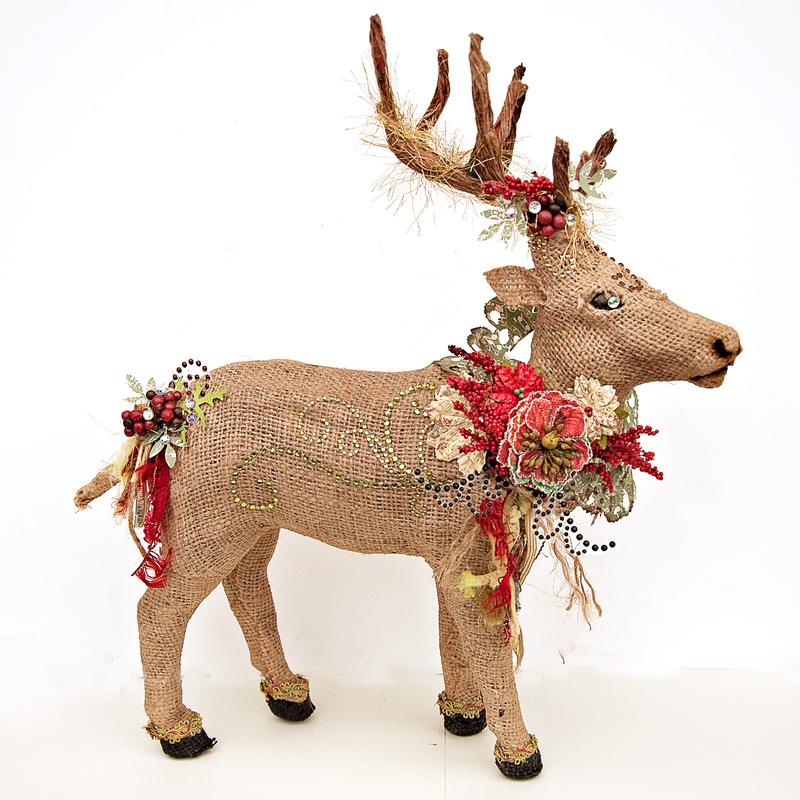 The swirls give movement to the reindeer. Very cute layout. What a beautiful gift box!! I am sure it will be treasured for years to come. Each winner will receive a Zva prize package worth $30.00. Congrats winners. Winners, please email our design team coordinator, Windy Robinson at windyrobinson@gmail.com to claim your prize! Ringing in the Christmas Season with some Fab-ulous Joy. 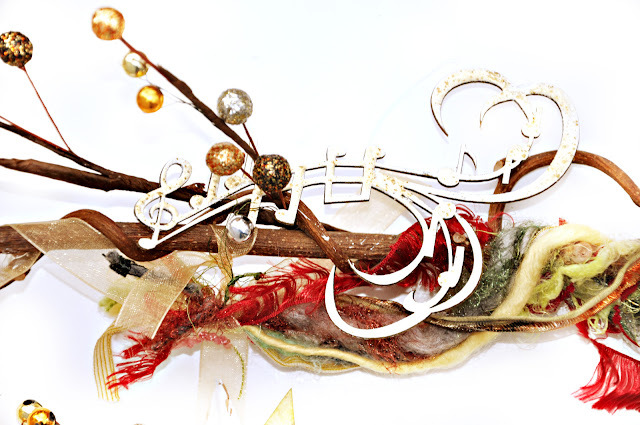 I made a swag or some garland from the FabScraps Christmas collection and Marie Antoinette Collection. They actually go nicely together. If you scroll down, you'll see my instructions for this project as well as the wonderful papers I selected. I must start out telling you about the inspiration for my piece. 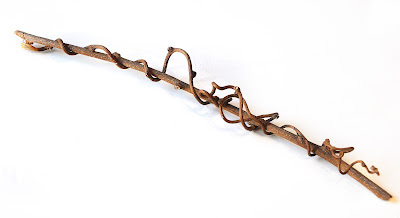 This decorative branch. It was salvaged from a floral piece delivered to my office. As the flowers leave their last beautiful petals upon the office floor, I'm stripping out all the cool stuff, like this branch. 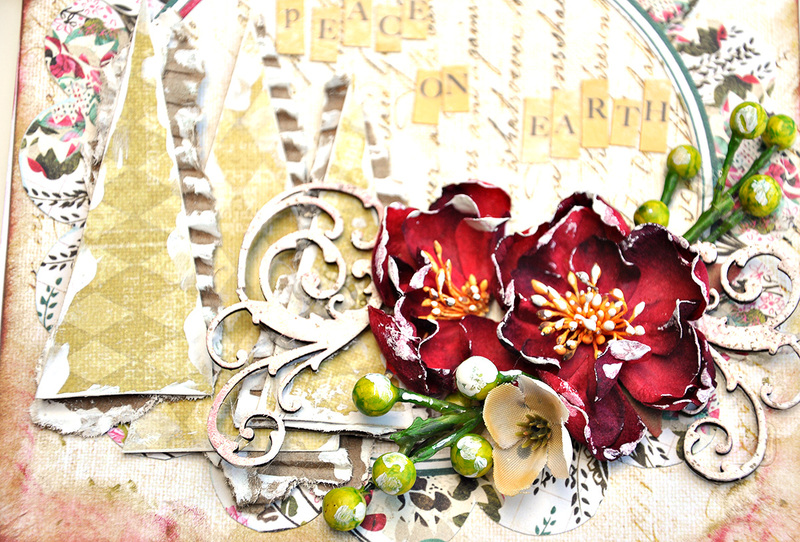 I love using the FabScraps chippies in unconventional ways. 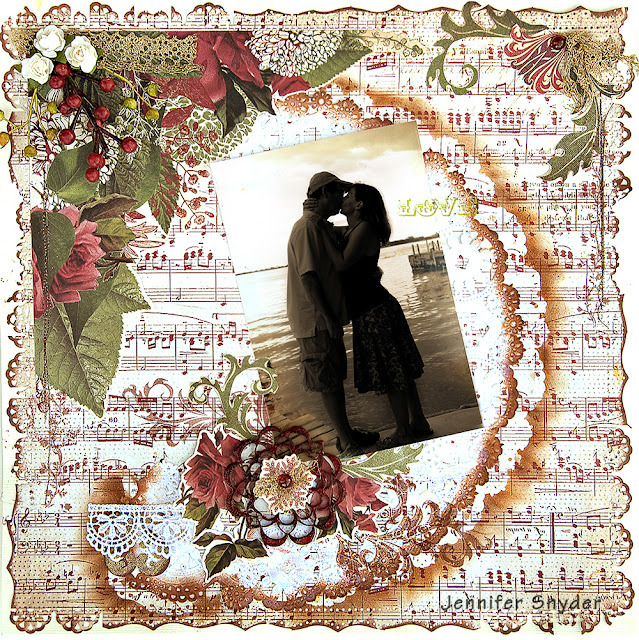 This has the Burlesque Collection Music Swirls – DC44 013 on it because it goes so nicely with what I think joy means. Joy is a happy word and meant to be sung. At my house, with a musician husband, everything is meant to be sung....just not by me. hahahahaaaaa. I also used some of his guitar strings that he winds up into a circle after he is done and has changed them out to new fresh strings. He leaves all his old strings for me to use. He started winding the strings in a roll years ago so that the garbage collection man would not poke his eyes out. Now, it's just for my purposes. The background paper of the star is Marie Antoinette Collection Garden C53 003. The letters are Christmas Collection Bells and Whistles C51 001 and Christmas Collection Santa’s Helper C51 008. 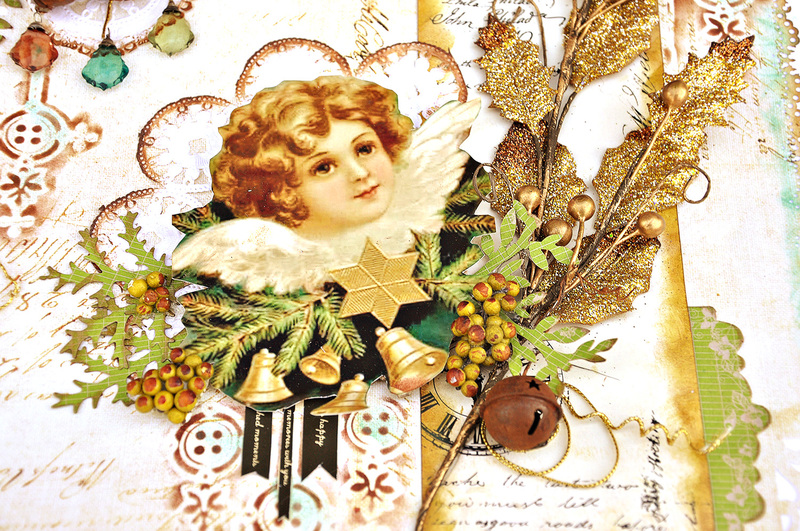 Here is a close up FabScraps Vintage Baby Collection Angel Wings -DC43 022. Thanks for looking. May your Christmas season be Fabulous and Joyful. 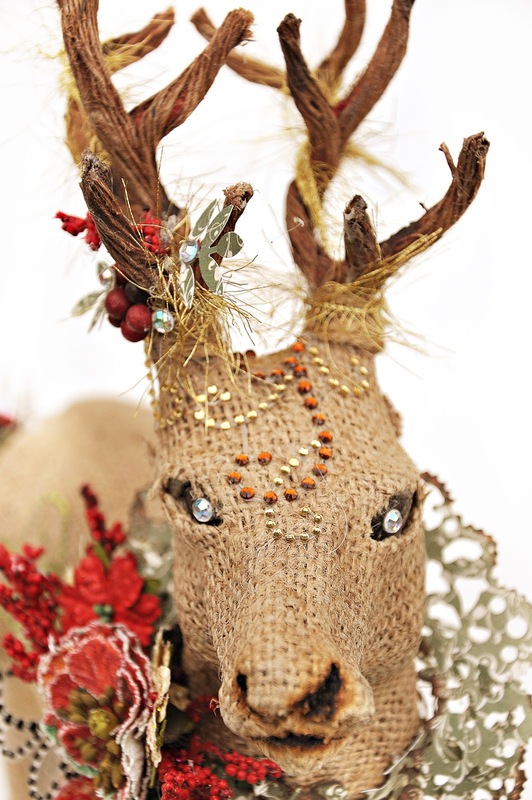 Check out the FabScraps blog for more Christmas inspiration. 1. 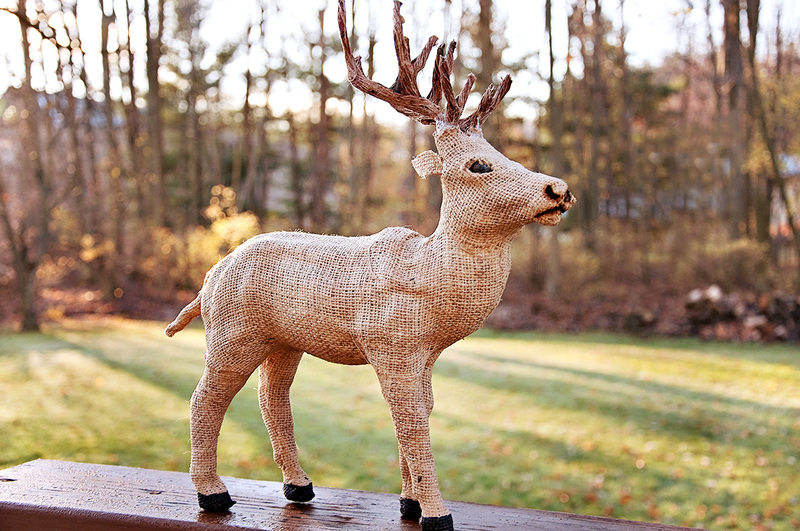 Using various fibers that are 60cm long, wrap a decorative piece of wood/branch in a swag-like fashion. Glue in place. 2. Cut 3 stars (measuring 10cm point to point) from cardboard and distress with white paint. 3. Cut 3 stars (measuring 10cm point to point) from Marie Antoinette Collection Garden C53 003. Ink the edges with green/ olive ink. Glue on top of the cardboard stars, a little off center making sure the cardboard is peaking out from the sides. 4. Decorate the stars with fibers. 5. Cut 3 ribbons 30cm long. 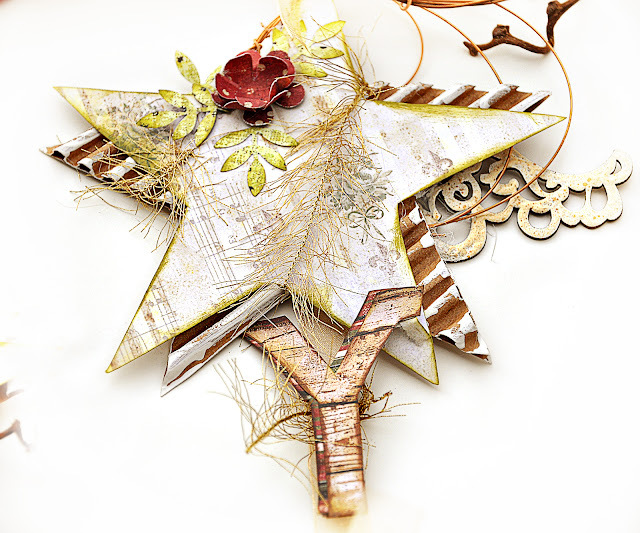 Tie one end to the decorative wood branch and glue the star to the ribbon near the center. 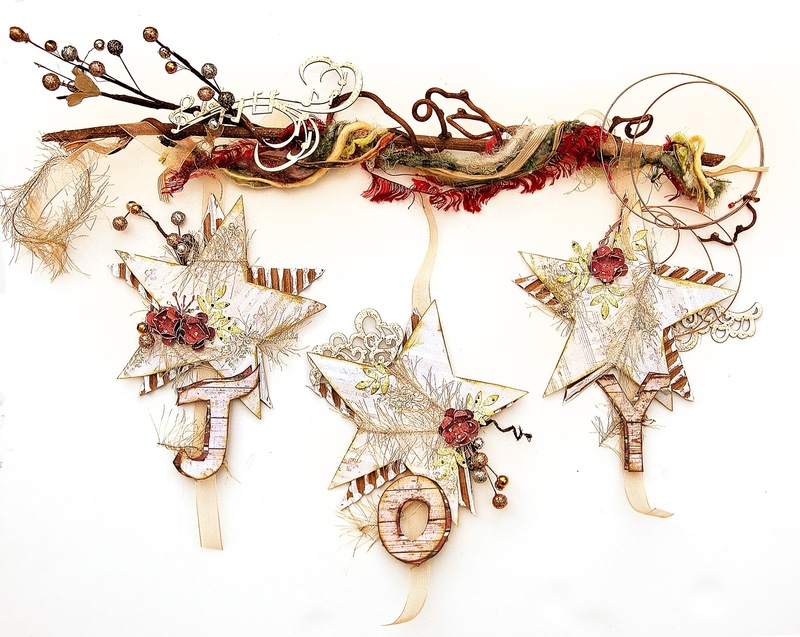 Make sure approx 8cm of ribbon sticks out from the bottom end of the star. 6. Flower Embellishment Preparation: mini flowers – each flower has 2 layers punched from Christmas Collection Little Children C51 007. 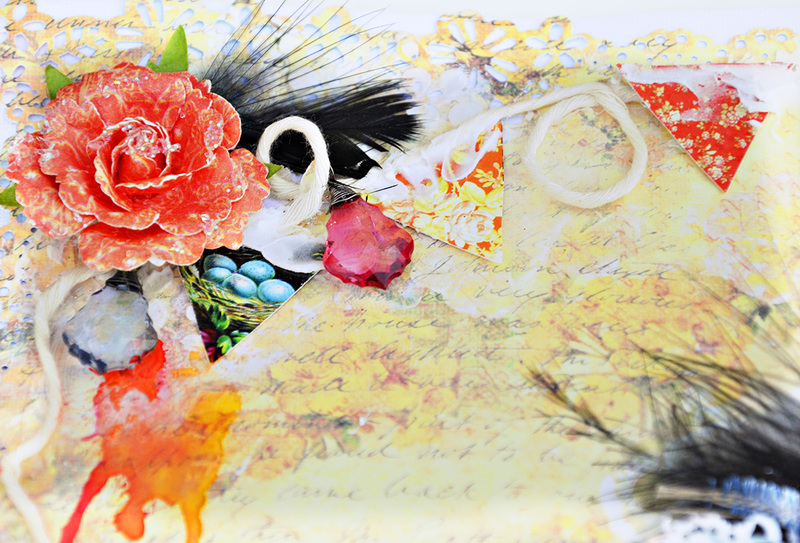 Use your choice of small flower punch or die. Glue two layers together and ruffle up the edges with your fingers. Add a gem on the center and glue on stars. 7. 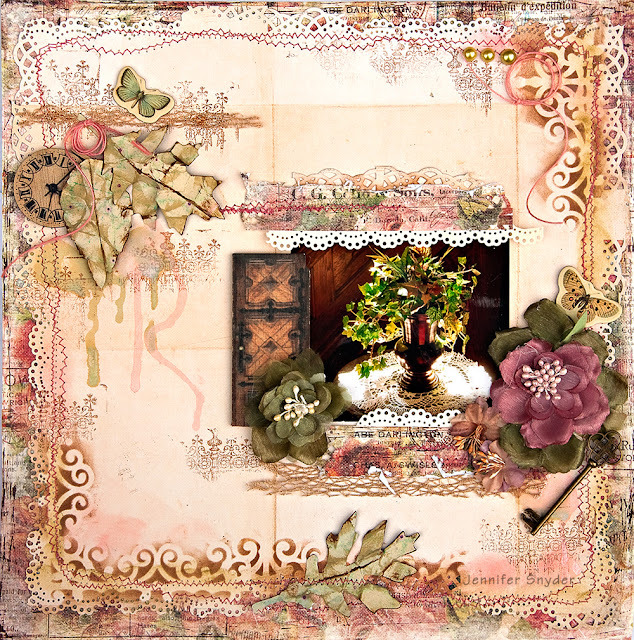 Punch leaves from Victoria Collection Victoria’s Tree - C49 001 – glue to accent the flowers. 8. 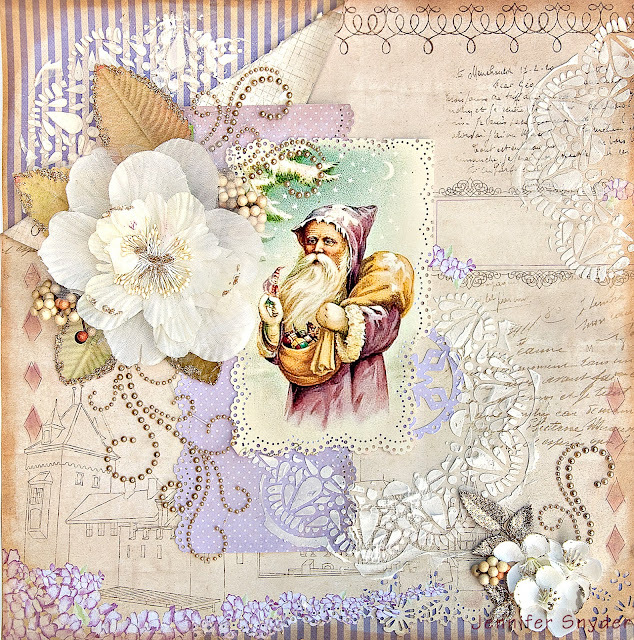 Punch snowflake shape from Christmas Collection Bells and Whistles – C51 001. Glue onto stars. 9. Decorate stars with fibers, metal, flowers, floral sprays as desired. 10. JOY Letter Embellishment Preparation: cut or punch letters (5cm long) from Christmas Collection Bells and Whistles C51 001 and Christmas Collection Santa’s Helper C51 008. Ink edges of letters with brown ink. Glue on top of each other for a layered effect. 11. 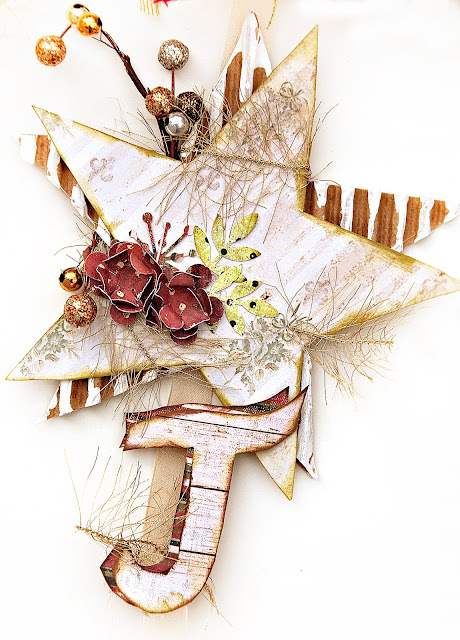 Glue letter to the bottom foot of the star and also to the ribbon. 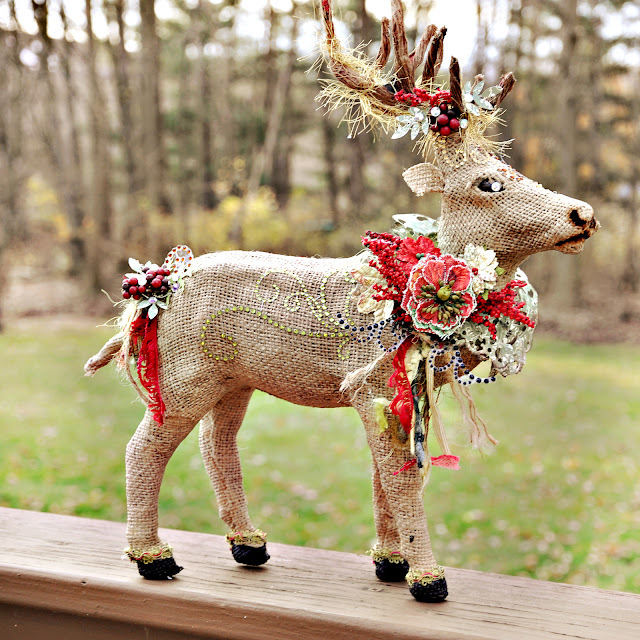 Decorate with fibers. 12. 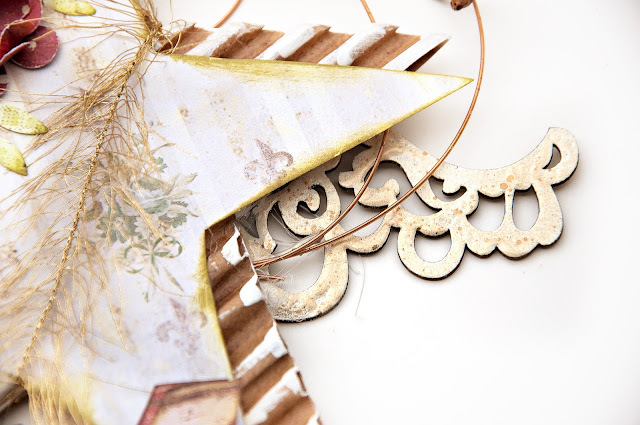 Chipboard Embellishment Preparation: Vintage Baby Collection Angel Wings -DC43 022 – emboss with white. Glue to the stars. 13. Burlesque Collection Music Swirls – DC44 013 – emboss with white and glue to the top wood branch. 14. 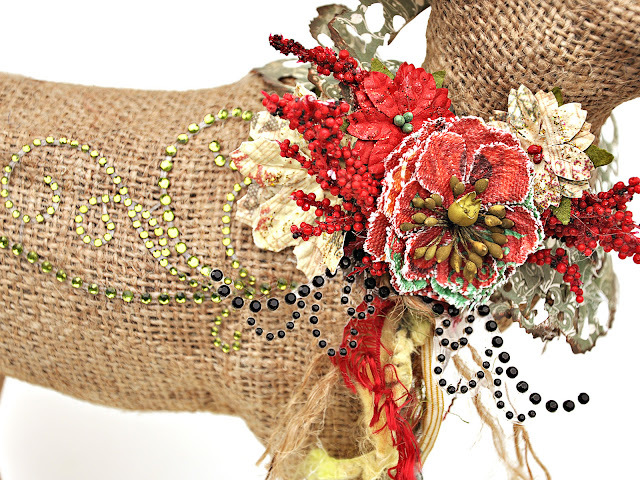 Finish off the piece with metal loops, fibers or floral sprays. Zva Creative and our talented Design Team welcome you to our November Holiday Blog Hop! 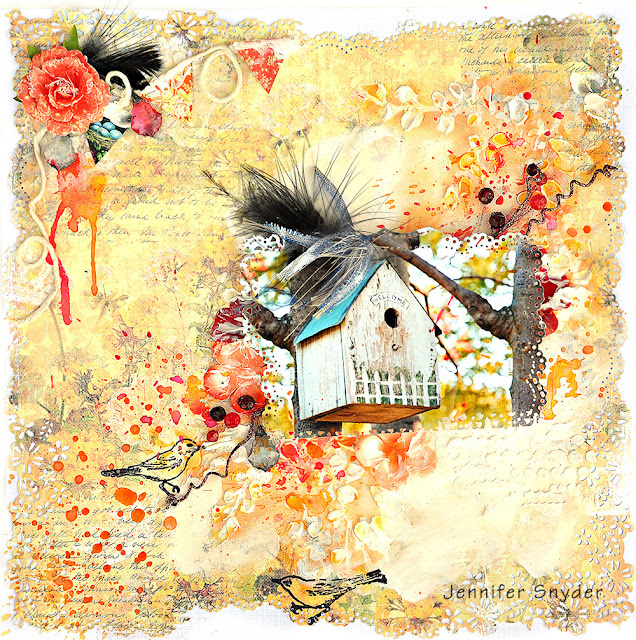 The Blog Hop begins at Zva Creative's blog! Be sure head on over to check it out! Leave a comment there for a chance to win an extra prize package just for visiting the blog and telling us that you stopped by! You will also find a complete list of all the participating blogs there (in case there is a glitch along the way). I created a Holiday Reindeer to get the holiday spirit rolling. The little critter started off this way. I snagged him in my back yard. 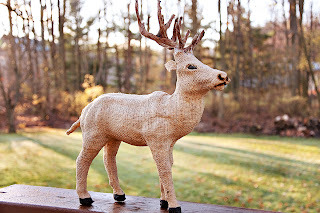 It's deer hunting season where I live. 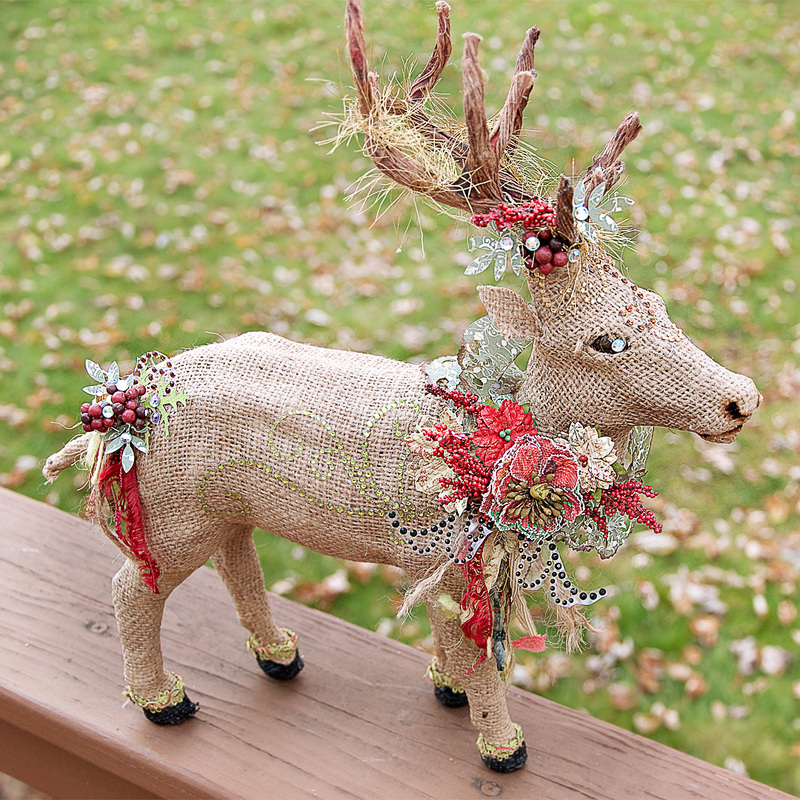 When we catch a deer, there's no eating him, just decorating him. 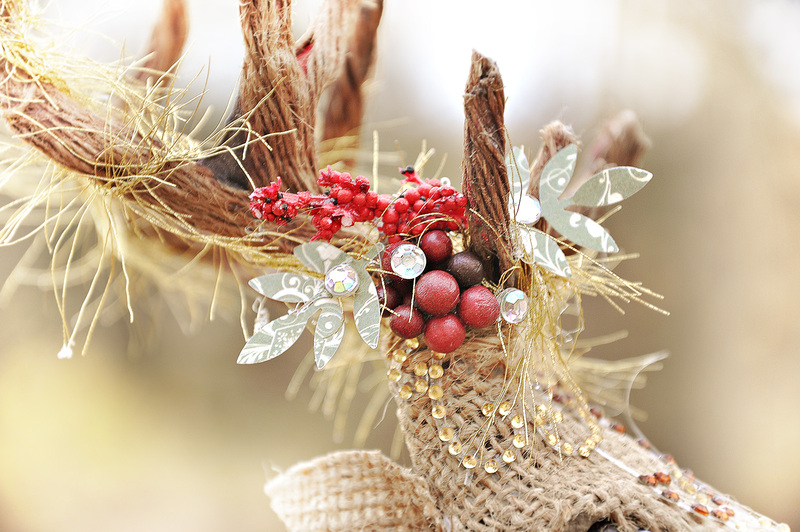 Not to sure about reindeer, but then again no reindeer live in my area, so in he came. I did something a little different with the CRW-05CA-133 (Symmetrical Flourish in Jet). I wanted the crystals to be three dimensional so I left them on the plastic backing and simply cut around them. You can see a bit of the plastic below in the photo, however in real life, they are perfectly clear and very cool. This is a better photo showing how I cut around the black crystals to add dimension to my creation. 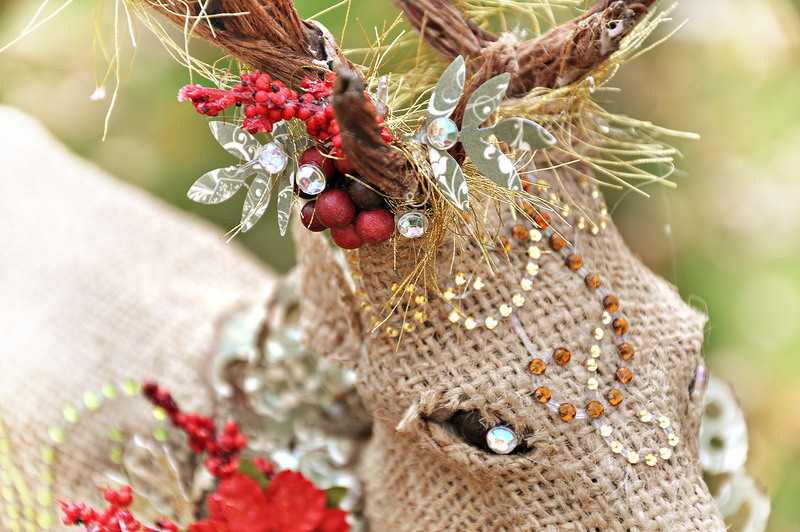 For a dose of holiday inspiration from our design team, just follow along the blog path. I am linking to one of the Zva designers and that designer is linking to the next and so on. Be prepared to be inspired along the way! 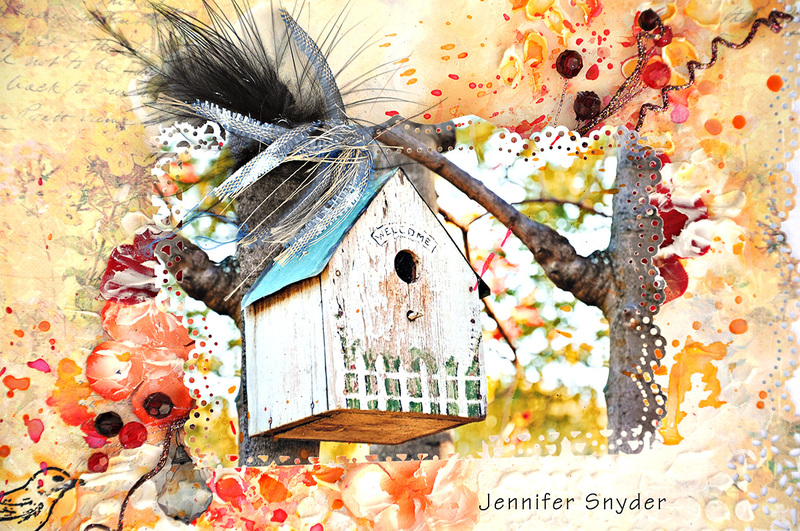 The Blog Hop starts today, November 26th and runs through midnight US Eastern Standard Time on Tuesday, November 27th. The 5 winners will be announced on Wednesday, November 28th on Zva Creative's blog. We will do our best to notify each winner, but it's best if you can pop in to Zva's blog on Wednesday to see if you are a winner! *Hop over to Zva's blog and leave a comment there to tell us that you made it there! The blog hop begins here at Zva Creative's blog. Your next stop is Lisa Somerville. Enjoy! P.S. 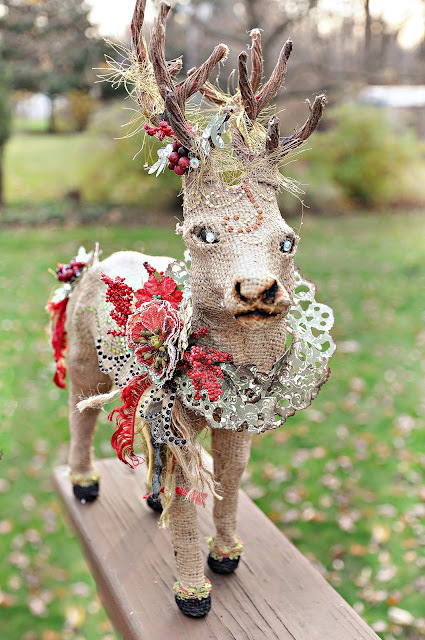 Mark your calendar to join us again on December 31st for our next Zva blog hop! 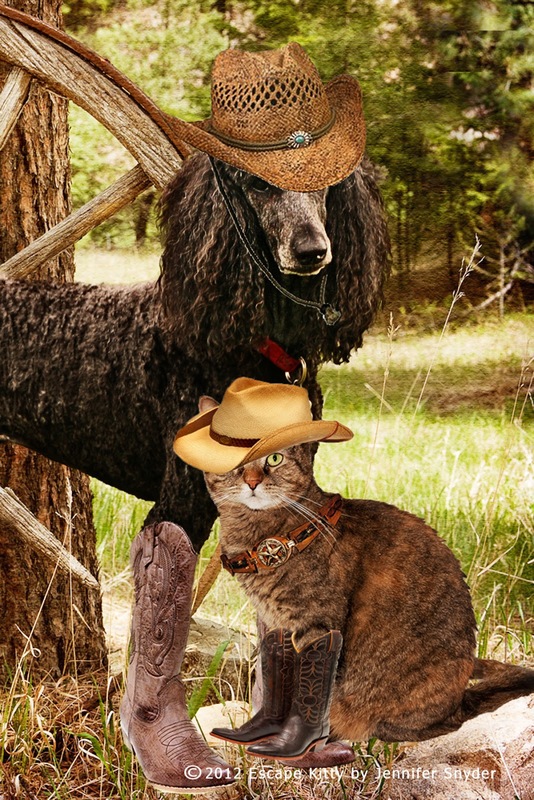 Escape Kitty needs your help! She has three little stories for a contest. The judges are looking for "LIKES" and comments/feedback n the stories. 3. Making comments - feedback. that would help me out a great deal and maybe help me win win win! 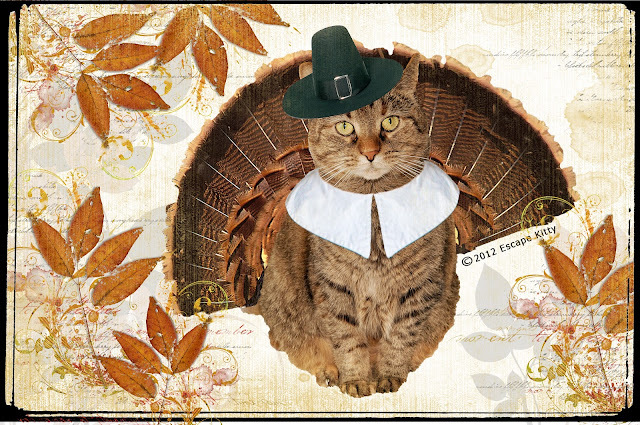 Happy Thanksgiving from Escape Kitty and from me. This was featured for the October Prima PPP. It's called Moments. You can see the original post here. This was featured for the Prima Oct BAP - Build a Page. Such thrilling and cool news. Thanks Prima staff for providing us with such wonderful opportunities. This is a photo I took in October in my neighbors yard. It was about 7am on Saturday morning and the sun was rising, the sky was blue and I had a coffee in one hand and my camera in the other. I also happened to be in my jammies and stalking the neighborhood for some autumn shots. Hopin and praying no one would see me. Ya know, not being all too obvious and all. This is also for the OUAS November challenge - the "two birds with one stone" thing where I am using one piece to satisfy two challenges. Very appropriate I'd say, given my photo choice as well as my stamping. The theme for the Once Upon a Sketch challenge is "Anything goes". The anything goes theme is also very fitting since I get up and shoot photos in my neighborhood in the wee hours in pajamas. Heck - anything goes. Here is the color palette for Prima's Nov PPP. Seriously rich gorgeous colors. and they happen to be my favorites. I LOVE all things orange . OUAS November challenge: Designed by Nadia Cannizzo. 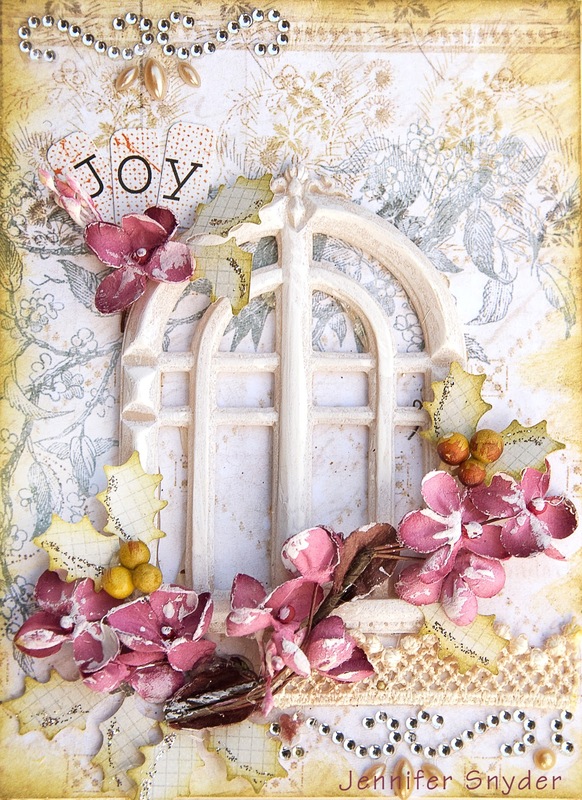 This is a page I created for entering into the Kaisercraft Saturday Sketch Challenges. This is Nov Sketch #2. 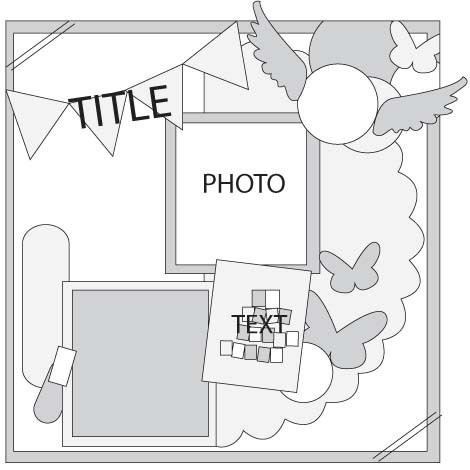 My layout is inspired by inspired by ‘Time Flies’ Layout By Kylie Obst. My husband and I went away to a music festival in July for a weekend in Alexandria Bay, NY. We had a great time with a bunch of friends, music and sunshine. This is a shot at sunset. Nice romantic weekend. 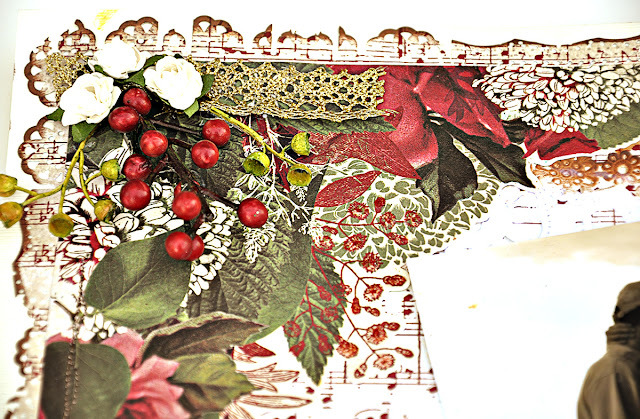 This paper was my perfect choice because it is a gorgeous rich piece with music notes. It will forever remind me of that wonderful get-away. 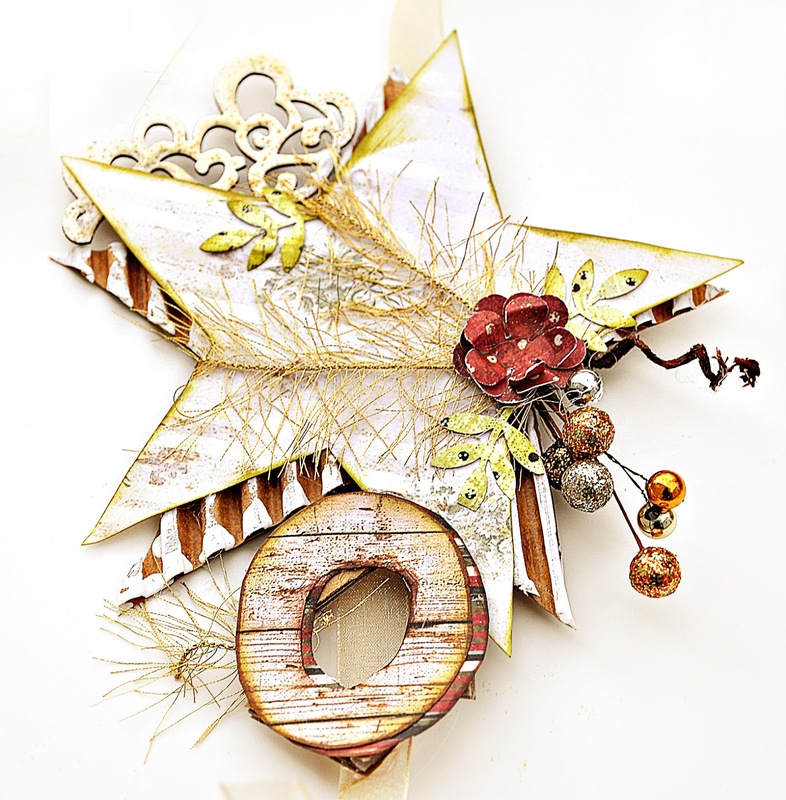 The Kaisercraft wooden doily is inked with Tim Holtz Aged mahogany and then topped with Crackle Accents. This is my entry for the Prima All About Fans Week #3 Challenge on Prima's Facebook page. Week 3 was about using packaging. So how did I use my product? I used three different products from different years, 2009, 2011 and 2012. The package from 2009 was the green package. I punched some leaves and stems out of the package and used as ever green sprigs on my page. 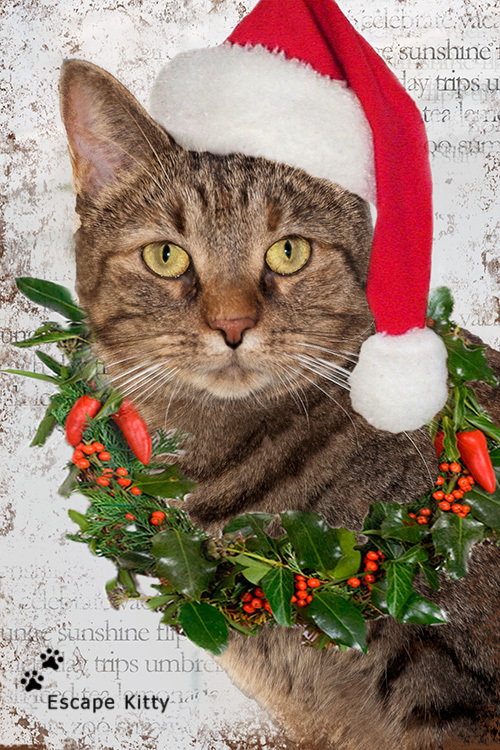 I also used the green at the top of the corner to dangle my bells. The package from 2011 was pretty obvious. I inked it with Donna Salazar Mixd Media Inx in Mossy and Tim Holtz Vintage Photo, then tucked it as a layer. Finally, the little black chevrons under my cherub were cut from the 2012 packaging. 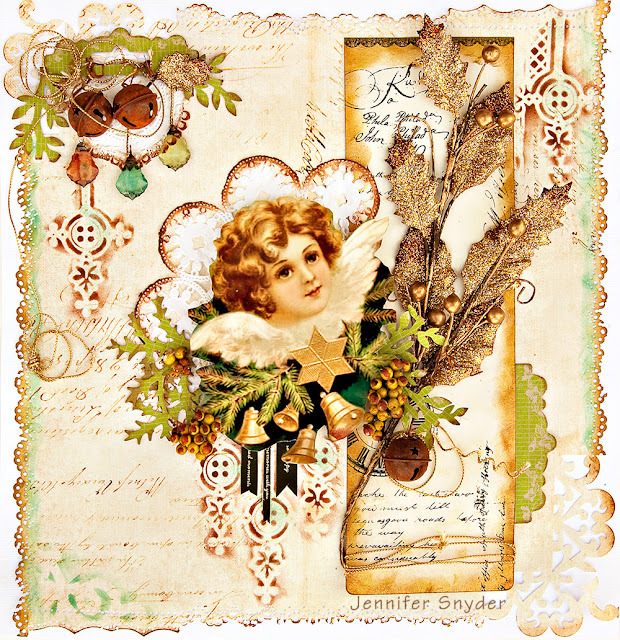 My cherub image is an old postcard from Flickr photo share. 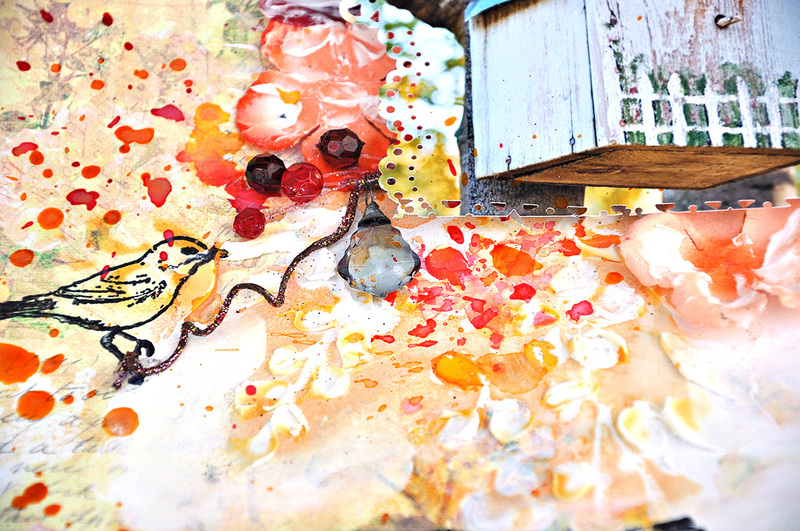 I used pieces of a paper oily with the edges inked for her angelic halo. I used three different edge punches on this. Lately, I'm on a kick to combine a whole lot of edge punches.